"Fortnite" has been a thorn in the side of Activision. But long term, the company is set up to be a big winner. 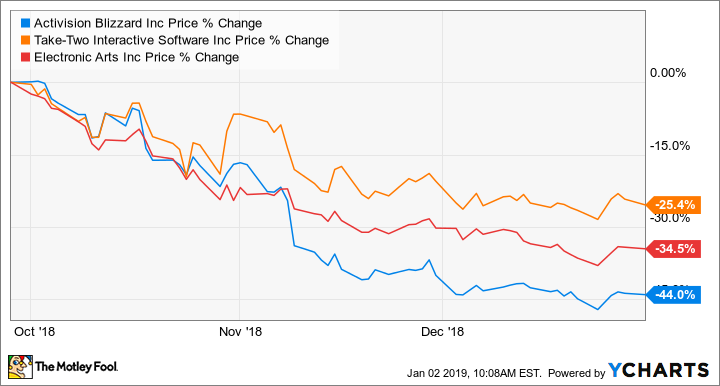 The last quarter hasn't been great for video game investors, but industry leader Activision Blizzard (NASDAQ:ATVI) has taken the brunt of a new pessimism on Wall Street. The company's stock has fallen 44%, versus a 25.4% drop at Take-Two Interactive (NASDAQ:TTWO) and a 34.5% fall for Electronic Arts (NASDAQ:EA). The questions heading into 2019 center around Activision's growth trajectory and its plans for new content and business models to compete with hit games like Fortnite. And that's where investors with a long-term view may see more light ahead than the market does right now. You can see above that the slide in video game stocks has been going on for three months, but early November was especially bad. That's when Activision Blizzard reported third-quarter earnings and gave a weaker than expected forecast for the fourth quarter, including $2.24 billion in revenue and $0.64 in expected non-GAAP earnings. That came in slightly below Wall Street's expectations and triggered alarm bells that new games like Call of Duty: Black Ops 4 and Red Dead Redemption 2 weren't the hits investors expected. Missing earnings or guidance is one thing, but what made the guidance miss such a big deal was Activision Blizzard's lofty valuation. Three months ago, the stock traded at over 120 times trailing earnings and 30 times forward earnings estimates. That's a price that can lead to disappointment with even the smallest earnings or guidance miss. 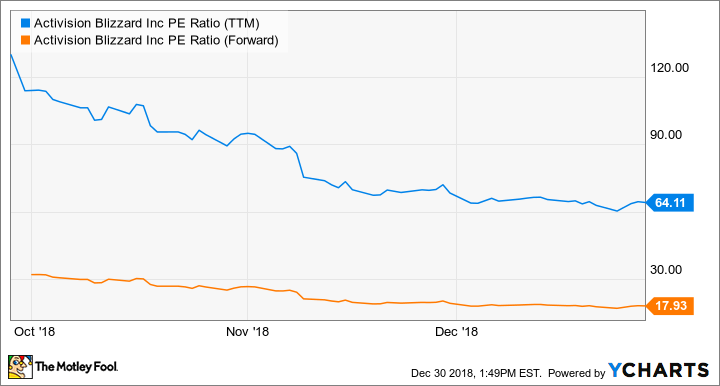 ATVI PE Ratio (TTM) data by YCharts. The good news: Shares are trading at a much more reasonable valuation today. And with a lot of growth opportunities, it could be a good chance to buy for long-term investors. Results for video game companies can swing wildly from year to year as games gain and lose popularity. In 2018, Activision Blizzard, EA, and Take-Two all faced a huge new competitor in Fortnite, the game that took the industry by storm early in the year. Short term, Fortnite is taking market share; but long term, Activision Blizzard is on the right path, with recurring revenue from games like World of Warcraft and Call of Duty, and an esports hit in Overwatch League. Esports could be a game changer for Activision Blizzard and the rest of the sector long term. Industry research firm Newzoo expects esports to be a $905.6 million business in 2018, engaging 380 million users. By 2020, esports is predicted to generate $1.4 billion worldwide. Overwatch League is arguably the most fully formed league, with billionaire team owners around the world, a dedicated stadium in Los Angeles, and a history of sold-out arenas. The league is expanding from 12 to 20 owners in 2019 and will continue to add advertisers as its popularity grows. Activision Blizzard continues to make progress in esports and mobile games, two major growth markets that investors shouldn't overlook after disappointing numbers in late 2018. A new value play in video games? Long term, I don't think the thesis underlying Activision Blizzard has changed at all. The company is a leader in video games with a huge digital and mobile platform and a lead in emerging esports. That's a great position to be in, and if investors can get in at a forward earnings multiple below 20, that could prove to be a great value. Sometimes the market overreacts to short-term news, and right now that seems to be the case with Activision Blizzard and video game stocks in general.